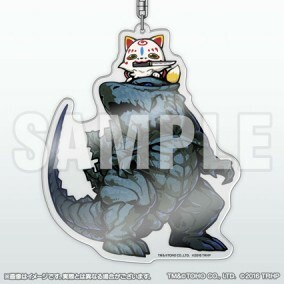 To celebrate the release of the animated movies “Godzilla: planet of the monsters” and “Touken Ranbu - Hanamaru - ～Makuai Kaisoroku～”, Nitro+, involved in the creation of both, is releasing a collaboration key holder! Godzilla, a nation-wide beloved character, making history yet again with an animated movie, and Konnosuke, making an appearance in the second preview of “Touken Ranbu - Hanamaru - ～Makuai Kaisoroku～”, have been drawn in super deformed style for the occasion by Nitro+’s resident graphic designer “minoa”. Available for preorder from (Tue) Jan. 9, 2018 at 12pm JST. Scheduled to ship from (Wed) Jan. 31, 2018.Please note that depending on circumstances, delivery may be delayed.